Our short movies can be found here and here. We explored several types of sky. We decided to go with the final approach of 3D-photon mapping . The water reflects the sky, and so finding a physically-accurate model for the sky required a lot of attention. Although some of the other methods looked pretty good, volume rendering the 3D photon map added the most realism to the scene. The density function for the sky is 3D Perlin noise. We traced 10 million photons through the volume of the clouds to generate a volumetric photon map. For space-efficiency and access time, we stored the resulting data as a 3D texture map. This optimization circumvented the costly search operation. Next, we used Peter Williams' "Volume Density Optical Model"  to render the photon map as a luminous volume. The photon map saved us the work of recursively tracing shadow and scatter rays from our primary ray-march, converting the exponential general-case volume rendering integration into a linear time algorithm. Linear waves: The lines of curvature are orthogonal and straight. There are globally two principal directions. These monotonic waves are the sort that a steady wind will cause. Circular waves: The lines of curvature are still orthogonal, but are not all straight. The first set of lines of curvature form concentric circles around a given point, while the second set are radial spokes from that point. This kind of waves occur in nature due to specific events (for example, when a large fish makes a splash). The technique is the one described by M. Finch . We found that if we only used one type of waves, the water looked nice locally but had obvious repeating patterns globally. Using the two techniques in tandem made the ocean look much more dynamic. Since the water is defined by simple wave functions, it was possible to accurately solve the governing partial differential equations for its motion. Using d'Alembert's solution to the wave equation , we animated the water in a physically accurate fashion without having to numerically solve PDEs. We used a stochastic process to simulate a realistic lightning geometry as a phenomenological model. 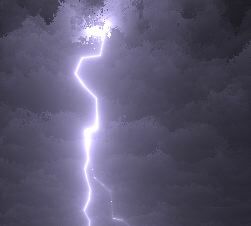 The program steps through the lightning in a random direction, determined by parameters to a recurive function, rotates a random amount, and branches a random distance. We control all the randomness with constraints and heuristics. 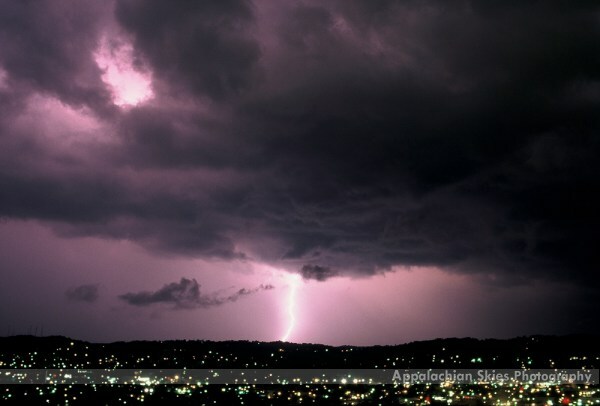 For example, the lightning branches less at the top and more towards the end. 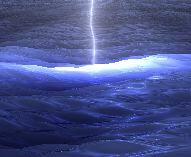 To add curvature to the lightning, we used sin waves with constrained random parameters. Additional measures were taken to force the main branch to always reach the surface of the water. As output, the lightning geometry generation program exports line segments. The line segments can either feed into our Modeling Studio or into the raytracer program. Although the geometries tend to look fine with no tweaking, we also decided to implement a Lightning Modeling Studio GUI to perfect the geometries before rendering. We implemented the Lightning Studio in YZ-Windows. 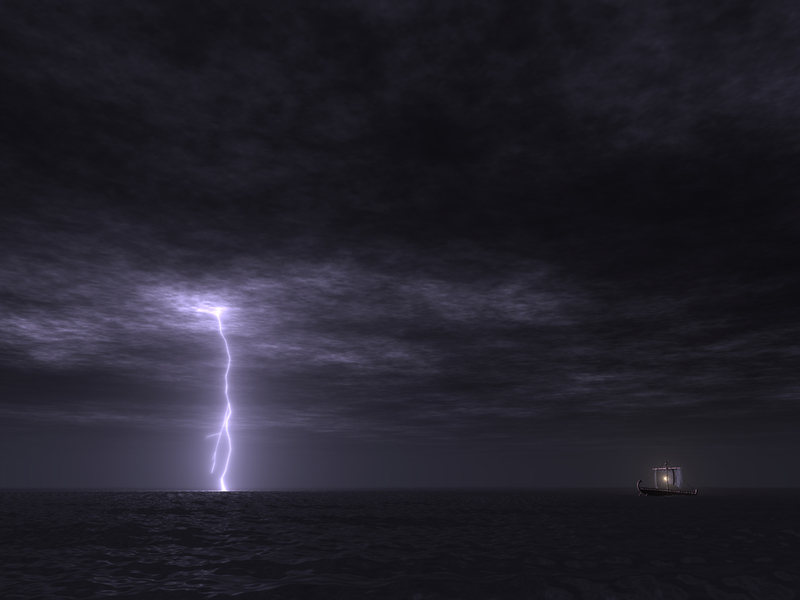 The lightning is rendered as a linear light source. Since it has negligable thickness, rays cannot collide with it, so to make it visible to the viewer, we had to render the entire atmosphere as a (very low-density) volume. 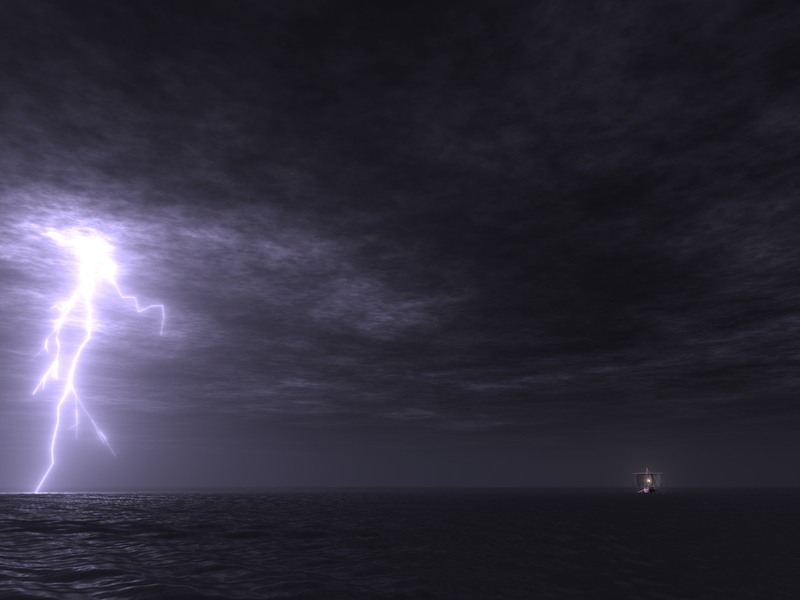 Atmospheric particles near the lightning reflect a large amount of light to the viewer, while particles distant from the lightning reflect little light. 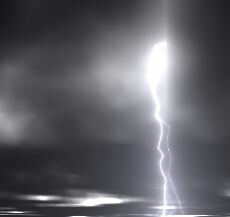 This produces the glowing visual effect for the lightning (in particular, the glow was NOT done as an image-space operation or camera effect). Since we wanted the atmosphere to appear perfectly smooth, we decided to use fixed sampling along the lightning rather than Monte Carlo integration for this portion of the rendering. This caused the noise in the atmosphere to be extremely low, at the cost of a small bias. To speed the volume integration up for the homogeneous low-density atmospheric medium, we used an approximation to the volume rendering equation and derived a closed-form expression for the contribution of a lightning segment to the glow along a ray. This saved us the expense of marching along each ray through the expansive atmospheric volume. The mathematics of the optimization are described in this brief document (PDF). 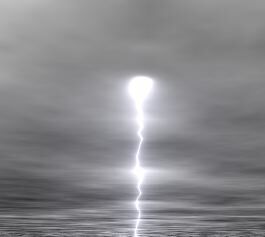 The lightning's reflection through the clouds was accomplished through a photon map, as described above; we used uniform random sampling of the lightning to generate photon initial positions, and traced their paths through the clouds to generate the photon map. 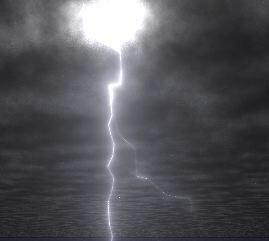 Diffuse shading calculations integrated the lightning uniformly by arc length. Our code only supports these lights in the form of discrete line segments, but our technique is general and may easily be applied to an arbitrary 1-manifold with boundary. The linear light sources can also define color and brightness as a function on the path. 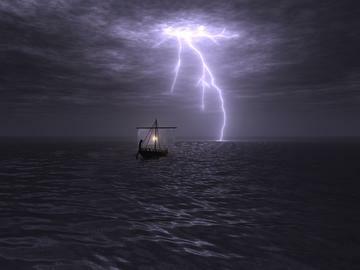 An useful and relatively simple optimization to consider for the future is importance sampling the lightning's geometry when performing diffuse shading calculations. This could be accomplished by using the combined brightness and projected angle of a lightning segment as a probability distribution function. Since our project primarly focused on lightning, we decided to use a model from a standard model library instead of modeling our own. 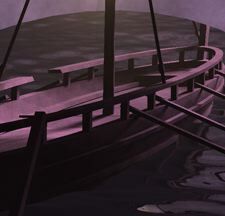 Later, we realized the need for more complex lighting for the boat, so we added a latern to the model of the boat. 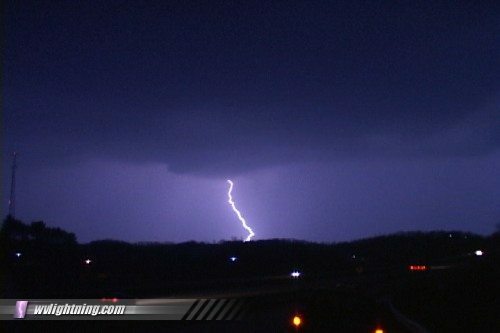 We model the latern as a short segment of lightning with a differenet color than the lightning itself. 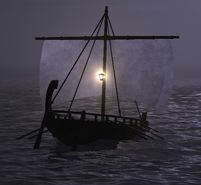 In the movie, the boat and lantern rock back and forth. 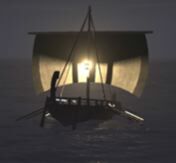 The boat uses a procedural Perlin noise texture for the sail, since we wanted to avoid the use of any external textures for our project. Diffuse shading and soft shadows are done by integrating the light sources by arc length, using Monte Carlo sampling. To speed up our test cycle, we implemented a simple network job distribution system. The program breaks the image down into one-pixel-wide vertical strips, and farms them out to participating cluster nodes. The overhead of this level of granularity is low, since each cluster node only loads the data component and performs preprocessing steps once per complete image render, and henceforth is available to render any number of strips sequentially. This approach allowed us to render the scene in a quasi-random order, and to display the results as they arrived, rather than waiting for the entire image to finish. In this way, we were often able to cancel bad renders after seconds rather than hours. For the last few days, we assembled a heterogenous cluster of the various computers we had access to (not including the public Stanford labs of course, since we knew everyone in the class needed those!). We managed to put together about 18GHz of processing power to render our final images! The final images were rendered at 3600 by 2700 pixels with 100 shadow rays per eye ray, and then resampled down to 1280 by 960 to reduce aliasing. 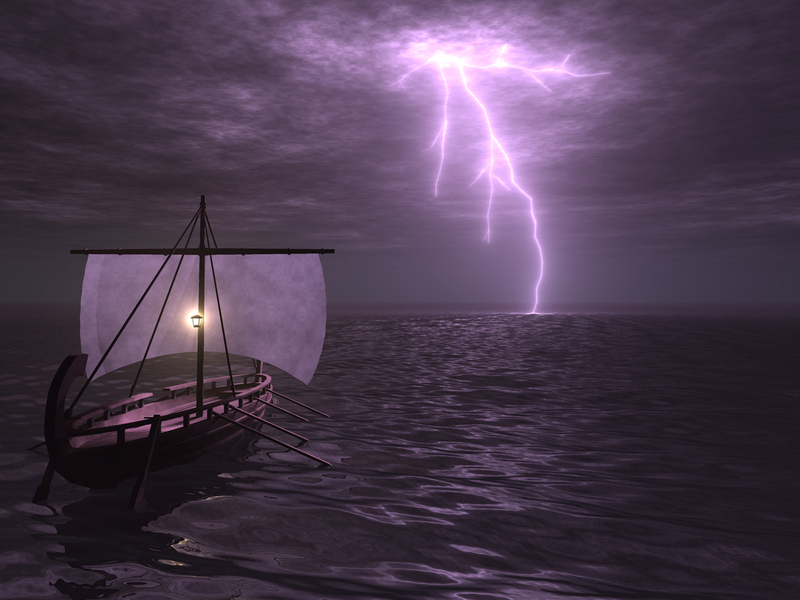 The close-up image of the boat with the purple lightning took about 8 hours of rendering time, and the distant views took about 1 hour each. Jensen, Henrik W.: "Realistic Image Synthesis Using Photon Mapping." AK Peters, 2001. Williams, Peter L.: "A Volume Density Optical Model." ACM Press, New York, 1992. Ebert, David S.: "Procedural Volumetric Cloud Modeling, Animation, and Real-time Techniques." Dobashi, Y. et al: "Efficient Rendering of Lightning taking into Account Scattering Effects due to Clouds and Atmospheric Particles." Musgrave, F. Kenton: "Quasi-Analytic Error-Bounded Ray Tracing of Procedural Height Fields." Finch, M.: "Effective Water Simulation from Physical Models," in GPU Gems. Addison-Wesley, Boston, 2004. Strauss, Walter A.: "Partial Differential Equations, An Introduction." John Wiley & Sons, Inc., New York, 1992. Internet: Vaisala Thunderstorm. "Frequently asked Questions About Lightning." http://www.lightningstorm.com/tux/jsp/faq/index.jsp, 2004.